Excited by his new role, Piercristiano Brazzale intends to work closely with the chairs of the IDF Standing Committees and Task Forces, and the IDF Team to deliver on the IDF Work Plan for 2019-2021. 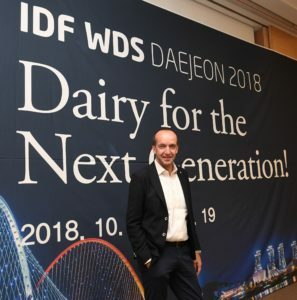 The Italian national, who is a board member of the dairy processor Brazzale Spa, was nominated as the new Chair of the IDF Science and Programme Coordination Committee (SPCC) at the General Assembly held on 14 October 2018 on the eve of the World Dairy Summit 2018 in Daejeon, Korea. He also now represents the SPCC on the IDF Board of Directors. Through the strength of his experience in the past three years representing the Standing Committee on Environment (SCENV), Mr Brazzale aims to promote the essential role of dairy in a nutritious, healthy and sustainable diet. Mr Brazzale intends to increase synergies between the various experts of the IDF community to maximize knowledge and resources. He advocated enhanced communications to showcase the depth of IDF knowledge and breadth of expertise and aims to work proactively to convince more dairy experts to contribute to IDF’s work. Besides his role in SCENV, Mr Brazzale, who has a Master’s degree in Agricultural Science from the University of Padua, is also a member of the Standing Committees on Dairy Science and Technology (SCDST), Farm Management (SCFM) and Nutrition and Health (SCNH), serving since 2012.